Jimmie Lee (Fuller) Rutherford, age 77, of Hayes Center, NE passed away on Tuesday, November 27, 2018 at Great Plains Health in North Platte, NE. Born August 30, 1941 to parents Hulin James and Alice F. (Caldwell) Fuller in Canadian, TX, Jimmie was one of four siblings. Jimmie grew up in Canadian, graduating from Canadian High School in 1958. On July 14, 1957 Jimmie married the love of her life, Raymond “Button” Rutherford in Canadian. The couple made their home there until 1962 when they moved to their farm northwest of Hayes Center. Over the years, the couple was blessed with two daughters, Christie and Pamelia. 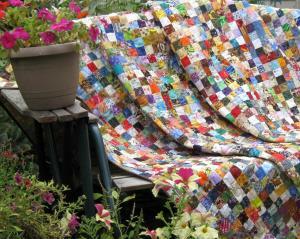 Jimmie was an avid quilter who learned to sew at a young age and continued her entire life. She also loved doing crafts such as painting porcelain and ceramic dolls as well as embroidery projects. She and Button loved to travel together and shared many special camping trip memories. Jimmie was preceded in death by her parents; her grandson Jesse Korell; and her husband, Button Rutherford. Those left to celebrate her life include two daughters, Christie (Kenneth) Korell of Hayes Center and Pamelia (Donny) Sailors of McCook, NE; brother. William Fuller of Kansas City, MO; two sisters, Bobbie Wohlford of Ft. Smith, AR and Frankie Helton of Canadian, TX; four grandchildren, Kevin (Erin) Korell, Brooke (Ryan) Amateis, Derek (Tasha) Sailors and Matt (Nicole) Sailors; and six great grandchildren, Kambrey, Stockton and Paisley Amateis, Jesse and Kinley Korell and Dean Sailors.